Okay, I believe you now, Oz was a dream. I never flew over the rainbow, whisked aloft in a big house in a cyclone’s vortex. And the house and I never fell back to earth and landed on the Wicked Witch of the East and crushed her like a boot crushes a bug. And there never were the Munchkins and Glinda and the Wicked Witch of the West and the yellow brick road like a path of gold, and the fighting trees and scarlet poppies and the identity-befuddled trio of the Scarecrow, Tin Man, Cowardly Lion. And the Emerald City really doesn’t exist, along with the Wizard, and Winkies—the witch’s former slaves. And I never killed the Wicked Witch of the West either, accidentally, of course, by dousing her with water. And afterward I wasn’t declared a hero. I wasn’t praised by the Winkies and the flying monkeys; no encomiums from the Wizard and other dignitaries. So I couldn’t have stayed, even if I wanted to, in Munchkin Land or the Emerald City. I could never have ruled as a good witch, sorceress, queen. I couldn’t have resided in the most magnificent palace, on the greenest, most verdant fecund sward you ever saw. And never ministered to a joyous, warmhearted people who loved and honored me. I never could have done any of that! Instead I live in dried up old Kansas. On a starved gray prairie, on a worthless farm. With an aunt who abuses me and an uncle who’s a moron—his apologies more frightening than her rages. Where every day it’s the same damn thing: Dish the corn for the chickens, yank the teats on the cows. Muck out the sties—the candied stench of manure. Churning, dusting, cooking, cleaning. I never get things clean enough for her. My guardians make me feel guilty about all they’ve done for me: saved me from the orphanage and given me a home. But this home is a wasteland without an oasis, a suffocating nightmare where I’m a slave. In addition to Oz I have another dream; more a waking fantasy than a storm-addled trip. I dream about burning down the farm or smothering Aunt Em and Uncle Henry. I dream about a twister that works, a huge arching whirlwind that flattens everything. I imagine flying away on a broomstick (forget about the implications). Truth is I don’t have any dates or friends. Em drives them away, or makes me feel so badly about them that it’s better not to see them than to face her derision. Oh, I wish I was back in Oz again. Even if it’s a hallucination it’s better than this. Anything would be better than this barren place. Things would be easier if Toto hadn’t died. He was my light, my spirit of play. He got me into trouble, but led me to places where I never would’ve gone if he weren’t my friend. There’s no place like home, there’s no place like home. But there’s no place like Oz, there’s nothing like Oz. I want to go back to its either-or truths. I want to be free and clearheaded again. I want to see my friends, particularly the Scarecrow; he was a genius before he got brains. I know there’s danger there for me because everyone can’t be happy that I killed the witches and unmasked the Wizard. Hell, I’m not happy about killing two people, no matter how wicked they were. Oz isn’t perfect, but it’s pretty damn close. There you travel down a road, you meet amazing people, you strive together, succeed—you feel good about yourself. Here you’re on a hayride to oblivion. I want to click my heels together and go back to Oz, but I can’t find the ruby slippers anymore. Maybe the best thing I can do is to wait for the next storm. When the wind roars like a runaway train, and that great black funnel-shaped cloud snakes towards me, I’m racing outside, arms outstretched, ready to embrace its glorious lie. 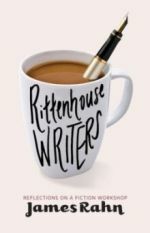 James Rahn leads the Rittenhouse Writers’ Group in Philadelphia, an acclaimed fiction workshop that he started twenty-seven years ago. His stories and articles have appeared in several magazines. He is the author of Bloodnight, a novel. His second book Rittenhouse Writers / Reflections On A Fiction Workshop is due out in May, 2016. “She Surrenders” was originally published in Currents, Summer/Fall 2012.